Field Notes – Earth uses the power of three new global maps to help answer important questions about our place in the world. What drives your choice to live in a high or low density location? Built using Esri’s AppStudio for ArcGIS, this free app shares the power of geographic information through a common language to describe in tremendous detail the landscape of planet Earth. Field Notes – Earth includes a small but significant sampling of the amazing questions that can be answered from Esri’s Living Atlas of the World, which includes beautiful and authoritative maps on thousands of topics. The three comprehensive maps from the Living Atlas of the World featured in Field Notes – Earth show highly detailed global information layers that provide stunning new insights into the world around us. Life. The World Ecological Land Units map shows the complex support system all living things on land depend upon and interact with. There are nearly 4,000 different colors on this map; each represents a different ecologically valid combination of climate, landform, rock type, and land cover. Oceans. There is still much to be discovered in the depths of the Earth’s oceans. The new World Seafloor Geomorphology map is a major step forward in our understanding of the complex role the oceans play in Earth systems. People. The new World Population Estimate map shows where people live across the planet. The map combines census data, satellite imagery, land cover, and roads to illuminate Earth’s human population. Maps like these update and transform our understanding and expectations in ways that help us to be wiser citizens of our planet, and Field Notes – Earth puts the power of these maps in the palm of your hand. Field Notes – Earth is designed to let you ask questions about the Earth from the convenience of your smart phone. 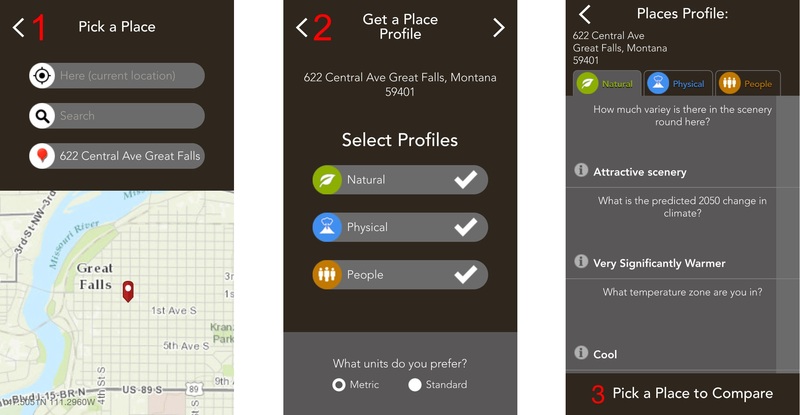 Available for iPhone and Android, Field Notes — Earth lets you pick a place (left), pick your profiles (center), and get results about your place. Simply choose a place, such as your hometown, your current residence, or a place you’re considering relocating to, and you’ll learn interesting facts about population, nature, and physical landscapes. Field Notes – Earth then gives you the option to choose a second location to compare and contrast the differences side-by-side. The ability to compare different places on Earth and gain understanding and knowledge from that experience is genuinely exciting. Maps like those found in Field Notes – Earth bring out the inner geographer in all of us and start meaningful conversations about important issues facing our world today. Field Notes – Earth is available now for iPhone and Android.